Please note: The latest version, including any updates, of this article is here. As I’m working on a product that will make heavy use of encryption, I’ve found myself trying to explain public-key cryptography to friends more than once lately. To my surprise, anything related I’ve come across online makes it look more complicated than it should. But it’s not. First of all, let’s see how “symmetric” cryptography works. John has a box with a lock. As usual, the lock has a key that can lock and unlock the box. So, if John wants to protect something, he puts it in the box and locks it. Obviously, only he or someone else with a copy of his key can open the box. That’s symmetric cryptography: you have one key, and you use it to encrypt (“lock”) and decrypt (“unlock”) your data. Now let’s see how asymmetric, or “public-key” cryptography works. Anna has a box too. It’s a box with a very special lock. Thanks to @leedykxhoorn for the illustration. Anna picks the first one of the keys and keeps it to herself. We will call this key, her “private” key -because only Anna has it. We will call the second key, her “public” key: Anna makes a hundred copies of it, and she gives some to friends and family, she leaves a bunch on her desk at the office, she hangs a couple outside her door, etc. If someone asks her for a business card, she hands him a copy of the key too. So. Anna has her private key that can turn from A to B to C. And everyone else has her public key that can turn from C to B to A. We can do some very interesting things with these keys. First of all, imagine you want to send Anna a very personal document. You put the document in the box and use a copy of her public key to lock it. 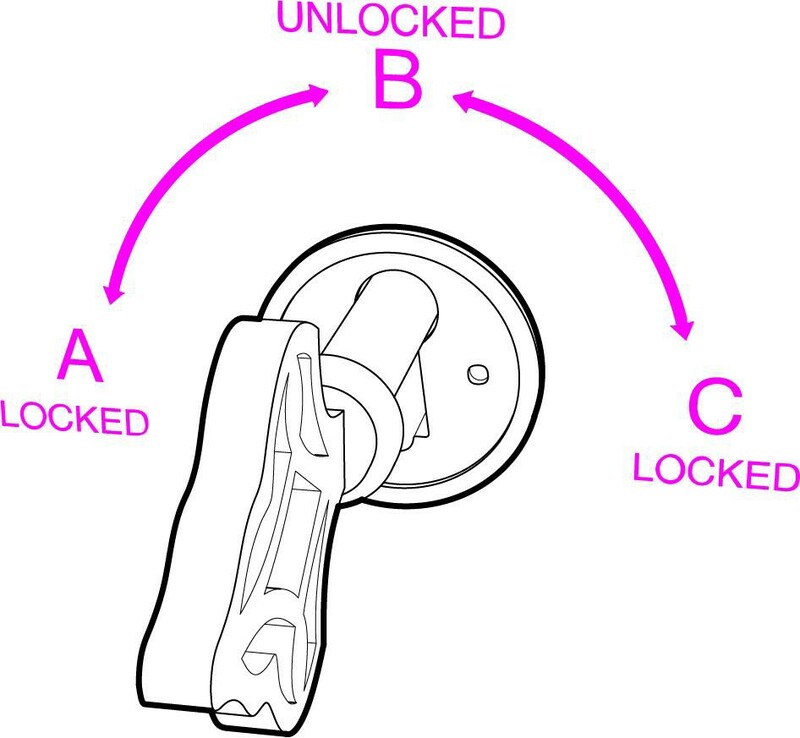 Remember, Anna’s public key only turns counterclockwise, so you turn it to position A. Now the box is locked. The only key that can turn from A to B is Anna’s private key, the one she’s kept for herself. That’s it! This is what we call public key encryption: Everyone who has Anna’s public key (and it’s easy to find a copy of it, she’s been giving them away, remember? ), can put documents in her box, lock it, and know that the only person who can unlock it is Anna. There is one more interesting use of this box. Suppose Anna puts a document in it. And she uses her private key to lock the box, i.e. turn the key to position (C). Why would she do this? After all, anyone with her public key, can unlock it! Wait. So, I’m sure that Anna, and no one else, put the documents in the box. We call this, “digital signature”. “Keys” are just numbers -big, long numbers with many digits. You can keep your private key, which is a number, in a text file or in a special app. You can put your public key, which is also a very long number, in your email signature, your website, etc. And there is no need for special boxes, you just “lock” and “unlock” files (or data) using an app and your keys. If anyone, even you, encrypt (“lock”) something with your public key, only you can decrypt it (“unlock”) with your secret, private key. [**] They can also get much more complicated: We can use our private key to sign a file and then someone else’s public key to encrypt it so that only he can read it. And one user, or an organisation, can digitally sign other users’ keys, to verify their authenticity, etc, etc. But all this actually breaks down to using the one or the other key and putting boxes into other boxes -and it’s outside the scope of this article.